Hermiston senior Cody Meeks tries to disrupt a shot by Pendleton's Devon Pulhamus. HERMISTON - It took two overtimes for the Hermiston Bulldogs (9-4) to defeat the Pendleton Bucks (6-7) on Thursday, February 19, 2009 by a score of 66 to 64. The Bulldogs are now tied with Madras White Buffalos behind the first place 10 and 3 Mountain View Cougars. The gym was nearly full with spirited fans of both teams on Thursday. Also performing at Thursday's game was the Hermiston Drum Line and the high school band. 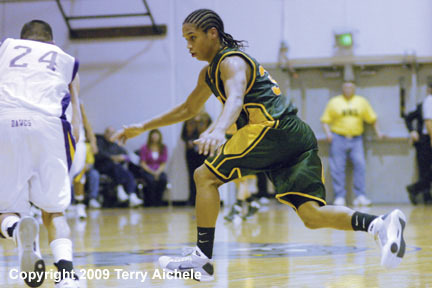 Hermiston scored first on a technical free throw to open the game. Luis Ortiz hit one of his free throws following an illegal dunk by one of the Bucks during warmup. Once Pendleton got the ball they had no trouble scoring. Buck junior post Devon Polhamus hit three shots in a row taking Pendleton out to a 8-3 lead in the first three minutes. Bradley Irwin of Hermsiton was the first Dawg with a scoring shot from the field. Irwin and Ortiz were the only Dawgs to score in the first. Josh Ernst also scored for the Bucks in the first. Pendleton led at the end of the first 14-8. Pendleton maintained their lead in the second period outscoring the Dawgs 14 to 13. Dawgs scoring in the second included Ortiz, Irwin, Jonathan Kayembe, Cody Meeks and Cody Humphrey. Pendleton scorers included Matt Baty, Polhamus, Lamar Fairley, Ernst, and Spenser Sundin. Pendleton led at halftime 28-21. Hermiston fired up the shooting machine after halftime outscoring Pendleton 15 to 10. That still wasn't enough to take the lead but Hermiston had closed to within two points at the end of the period. Dawgs scoring in the third included Ortiz, Humphrey, Irwin, and Kayembe. The crowd came alive on several plays during the third period. In one situation Cody Meeks stole the ball from a Buck and tossed it to Humphrey for two. Towards the end of the period Kayembe stole a pass and went all the way to lay it up. The Bucks could only score five points in the first five minutes of the period. Buck Spenser Sundin hit a trey and Ernst hit two freethrows to keep Pendleton in the lead. The third ended with Pendleton leading 38 to 36. The fourth period was a seesaw with the teams exchanging the lead several times. Hermiston led by as much as six and Pendleton led by as much as three. Polhamus for Pendleton scored their first four points. Kayembe and Oritz started the scoring for Hermiston. Irwin was foulded on a layup and hit the freethrow giving the Dawgs a 44-42 lead. Irwin and Ortiz then hit five freethrows to give Hermiston the 54 to 51 lead. Matt Baty of the Bucks worked the baseline for a layup to tie it at 53 with eleven seconds to play. Hermiston turned the ball back to the Bucks with seven seconds to play. Pendleton couldn't score and with the game tied at 53 at the end of regulation it was on to overtime. 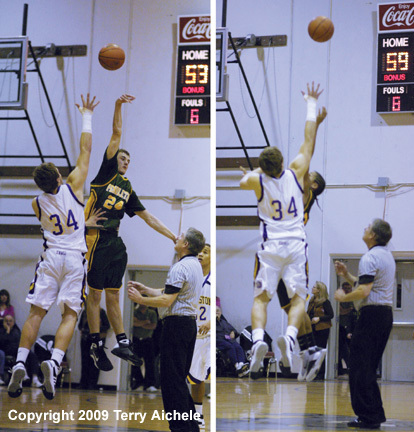 The first four minute overtime was the first jump ball in the game due to the opening technical foul by Pendleton. Baty of the Bucks fouled Humphrey who missed his two freethrows. Hermiston scored first on a followup shot by Irwin. 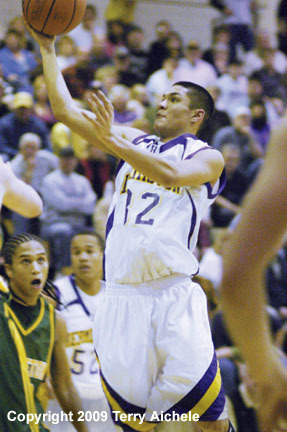 Then Hermiston's Ricardo Rodriguez scored off a Meeks bounce pass to stretch the Hermiston lead to 57-53. 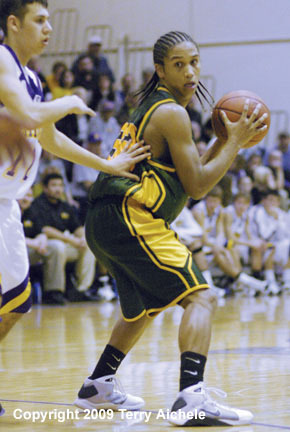 Pendleton came back with a freethrow by Polhamus. The wave of sound from the supporters of both teams reverberated inside the gym. Pendleton tied it at 57 with a trey by Sundin which brought an explosion of cheers from the Pendleton fans. Polhamus was fouled by Irwin and the left handed shooter hit both to take the lead 59-57. Hemriston's Mike Royer hit a layup with 34 seconds to play to tie it up at 59. The second four minute overtime started off with a layup by Humphrey. Pendleton's Ernst fouled Irwin who hit both to give the Dawgs a 63 to 59 lead. Alec Wyland of Pendleton hit a freethrow. Hermiston's Irwin hit another freethrow to take a 64 to 60 lead. Polhamus then hit two freethrows for the Bucks closing the gap to 64-62. 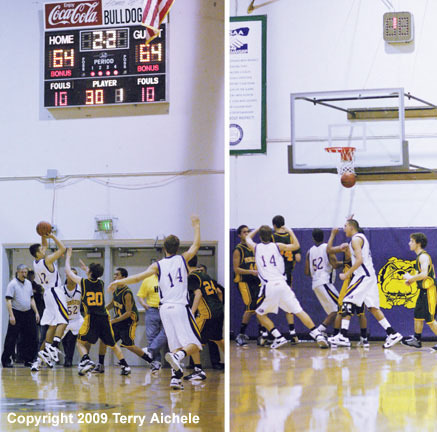 Hermiston couldn't inbound the ball and turned it over to Pendleton with 42 seconds to play. Out of a mass of players a Buck made the tieing shot. Hermiston took their time out with 18 seconds to go. 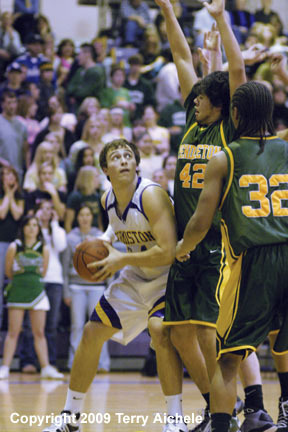 Hermiston inbounded the ball and started working it around various players. The ball finally ended up in Bradley Irwin's hands. 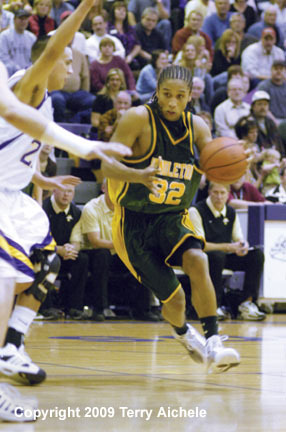 Irwin was situated in front of the Hermiston bench and just inside the three point arc. The clock ticked down 5. . .4. . .3. Finally with 2.2 seconds let Irwin let fly with a jump shot that hit the basket perfectly. Hermiston won 66 to 64 as the crowd went wild cheering the win. LEFT - Hermiston's Luis Ortiz takes a shot. RIGHT - Jonathan Kayembe of Hermiston passes the ball. 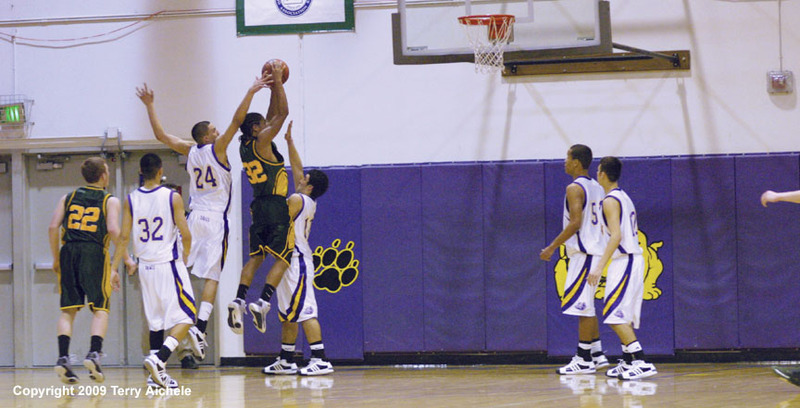 LEFT - Hermiston senior Jonathan Kayembe tries to snake his way through two Pendleton defenders. 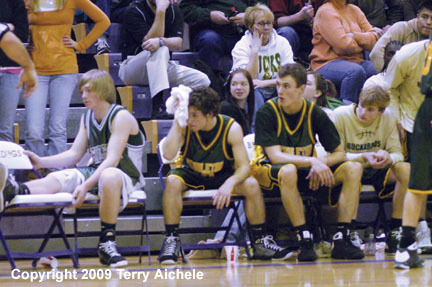 RIGHT - Pendleton junior Travis Jones holds a towel to his head following a colision that sent him to the floor. The cut on his forehead was bleeding and play was halted while he was taken care of and the blood was cleaned up. 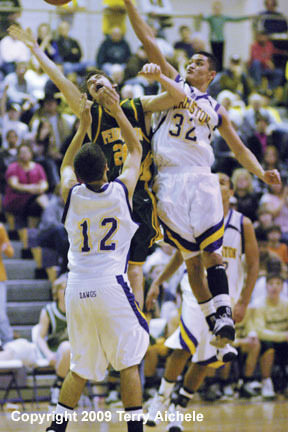 LEFT - Hermiston senior Cody Humphrey eyes the basket being guarded by Tyler Sampson and Devon Polhamus. RIGHT - Hermiston's cheerleaders perform a high toss. 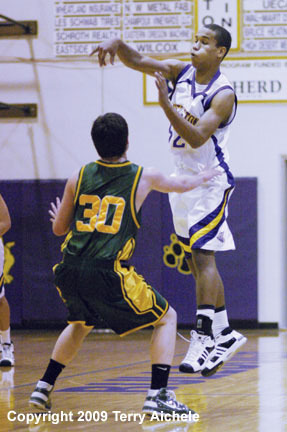 LEFT - Lamar Fairly of Pendleton drives past a Hermiston defender. 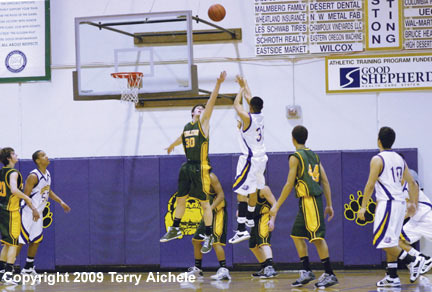 RIGHT - Hermiston's Luis Ortiz takes a shot over Alec Wyland of Pendleton. 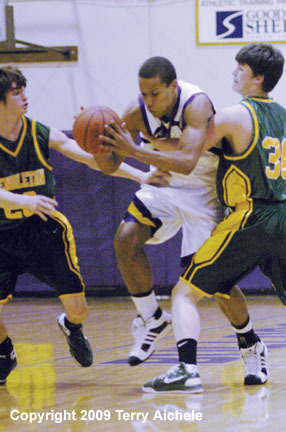 LEFT - Luis Ortiz and Bradley Irwin of Hermiston battle for the rebound with Spencer Sundin of Pendleton. RIGHT - Devon Polhamus of Pendleton was one of the Bucks hot shooting players in the game. LEFT - Pendleton's Devon Polhamus looks over his shoulder at Hermiston defender Bradley Irwin. RIGHT - Cody Meeks had to take on Matt Baty in the tip off to the first OT, left, and Devon Polhamus on the right, for the second OT. 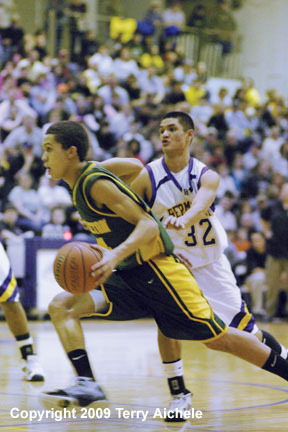 LEFT - Pendleton's Devon Polhamus switches to defense while guarding Hermiston's Cody Meeks. RIGHT - The winning shot by Bradley Irwin of the Dawgs. On the left, Irwin is preparing to release his shot. On the right the ball going through the net for the win.